Archbishop Benson is a very happy and successful school built within a large, attractive site overlooking the City of Truro. It is a mainstream state school which caters for children from the ages of 4 to 11 years old, with over 420 pupils on the register. The school established a clear classroom space in order to build a new ICT Suite which could optimise the use of ICT for all pupils. They wanted to extend use of the ICT hub so it was available to more pupils throughout the school day and also for extra curricular activities. In addition, hardware needed to be upgraded and more desktops were required. NCI's team of engineers have established a strong reputation in designing and installing bespoke ICT suites, not only in local, UK schools but as far afield as the Falkland Islands and the Philippines. The team surveyed and measured the room in order to design the best layout to maximise the use of space. They aimed to create a child-friendly learning environment that is safe, robust and facilitates effective teaching and support. The desks were custom built and ergonomically crafted with curved, bevelled edges for ultimate safety and comfort. The suite is designed for the efficient and neat installation of hardware, minimising the impact of trailing cables with dado trunking and compact mini PC's. 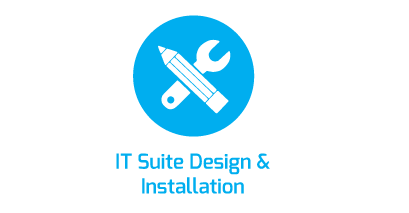 Find out more about our ICT Suites by clicking the blue icon below.